The audio-visual artists of TheHolographicPrinciple.com announce the release of “Bring Back Lincoln”, an online, audio-visual abstract art exhibit dedicated to the memory of Abraham Lincoln. Bring Back Lincoln is the first in our series of historical artistic audiovisual interpretations. The presentations are a combination of abstract visuals generated by historical photos, original poetry, original soundscapes and voice-over performance. TheHolographicPrinciple.com presents "Bring Back Lincoln”, an online, abstract art exhibit dedicated to the memory of Abraham Lincoln. “Bring Back Lincoln” is now available for viewing at TheHolographicPrinciple.com. “Bring Back Lincoln” is an abstract art exhibit presented as an audio-visual experience. It combines original music set to the poem, “Bring Back Lincoln” by Joe Menghini as read by Dallas voice-over artist, Christopher Oliver, with abstract visuals and motion graphics derived from historical photos. The work centers on the assassination of President Lincoln beginning with the walk to Ford’s Theater and ends with flashbacks through the carnage of the civil war. Christopher Oliver, Dallas voiceover artist, says, “Bring Back Lincoln is the first in our series of historical artistic audiovisual interpretations. The presentations are a combination of abstract visuals generated by historical photos, original poetry, original soundscapes and voice-over performance. 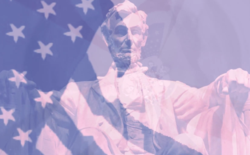 TheHolographicPrinciple.com focuses on artistic historical interpretations and our first exhibit is dedicated to one of the most significant historical figures and champion of American freedom, Abraham Lincoln.”. According to TheHolographicPrinciple.com, “Artwork (ie: information) is stored on given surface area of a region that bounds it, but the artists, their materials, their individual molecules and their very atoms are also stored there along with their complete histories and according to the 1st law of thermodynamics, energy is always conserved and can not be created of destroyed. Joe Menghini, Kansas City artist, poet and composer says: “It is with profound astonishment that I reflect upon Abraham Lincoln’s efforts toward equality, freedom and unity which resound to, and are intertwined in, the fabric of eternity and the far reaches of the universe where, should we ever again have need to question their sanctity, they now reside". TheHolographicPrinciple.com is an ongoing audio-visual project that combines the strange physics of quantum gravity and string theory with history and art. The Holographic Principle takes its name from the theory first put forth by Gerard t’Hooft and Stanford University physics professor Leonard Susskind which was later experimentally verified by theoretical physicist Juan Maldacena from Buenos Aires, Argentina. The Holographic Principle maintains that all art and all history can be thought of as Planck-sized bits of information that are perfectly described as residing on the surface area of a region and not the volume of a region. According to the 1st Law of Thermodynamics, energy is always conserved and can be changed from one form to another, but cannot be created or destroyed. The 2nd Law of Thermodynamics states that entropy always increases over time. The Holographic Principle describes complete information within the boundary of such a region. The Holographic Principle states that everything that happens in a spacetime can be explained in terms of information stored on the surface of the farthest boundary in the universe, or if you prefer, the multiverse. For more information about “Bring Back Lincoln” or TheHolographicPrinciple.com or to experience “Bring Back Lincoln” visit their website at theholographicprinciple.com.